Elance and oDesk have announced that they are merging. Each will continue to operate individually (for now). They have not yet revealed what their new, combined, company name will be. It is expected that the deal will conclude sometime in the next four months. Elance is a marketplace for online work. It is somewhere that freelancers can go in order to find freelance jobs. Over 1.3 million jobs are posted through Elance every year. The company they are merging with,oDesk, also helps businesses find freelance workers. Cumulatively, oDesk has had more than $1 billion of work completed through it. Both companies provide very similar services, and it appears the main purpose of the merger is to continue to do what they already do (but more effectively). Freelancers who are using either company right now can expect their profiles, work history, and other parts of their online reputation there to be unaffected by the merger. Clients will still be able to hire, manage, and pay exactly as they had before. I recently ended up purchasing a TomTom GO 2535M Live portable 5” widescreen GPS unit at a Best Buy store. With tax, the total price ended up being just under $300 dollars. For the past 6 years or so, I’ve had a Garmin C550 with a 3.5” touch screen that is hard drive based. Since I drive a truck over-the-road, the Garmin has been running almost 24/7 for those six years, taking very high amounts of what can often be severe jolts and vibration along with occasional extreme heat and cold. I’ve paid to update the maps in the C550 about three times, but I’m reluctant to pay to update the maps again since I really don’t know how much useful life the hardware, particularly the unit’s hard drive, has left in it. For the time being, the aging Garmin is still working so I’m using it side-by-side with the new TomTom unit. In my experience the perfect GPS unit has yet to be sold. Each brand has it’s strength and weaknesses. I’m including in this software-based solutions such as Google Navigation, Telenav, etc. that frequently comes bundled with Android or other smartphones. Maps used in GPS devices have improved dramatically, but they are accurate only about 90% of the time, and this includes Google itself. As a truck driver I’m looking for new addresses on average about two to three times a day, sometimes more and sometimes less. About 10% of the time I run into errors, sometimes with the potential to cause catastrophe – think narrow streets, weight-restricted bridges, etc. Right after I bought the TomTom I had to go to a cold storage in Chicago, Illinois that the TomTom could not find, but the Garmin could. It turns out the street had been given two names with dual street signs, one below the other. The TomTom could find what was probably the original numbered street name, but not the other, which was a woman’s name the city was obviously trying to honor. At that point I was unhappy with the TomTom’s performance, but decided to continue to give it a longer chance before rushing into a knee-jerk judgment of the device or its software. The TomTom redeemed itself later that day by warning me around a 15-mile-long traffic backup in northern Indiana on I-65 which ended up saving me hours of sitting waiting for a major accident to be cleared and the road opened back up. The TomTom is different than the Garmin. TomTom has a different way of doing things. The GO 2535M Live is a fairly sophisticated device. It even has a full-time GSM data connection to the TomTom server with the ability to do real-time Google searches, either locally or in other locations, get live traffic and weather updates, and do real-time rerouting to avoid traffic problems. Though the unit has free lifetime map updates from TomTom and a year’s worth of live “HD” traffic and weather updates, the live “HD” traffic and weather update service is just under $60 per year. Once you create an account at TomTom.Com you can sign in to your account with the unit itself. Incidentally, I’m willing to pay $60 dollars per year for accurate, up-to-the-minute traffic and weather information. That type of information can end up saving a lot of time and trouble as long as it’s presented as soon as it becomes available. The unit can even accurately display areas of traffic backups and slowdowns. After I’d had the unit for about a week and a half, it was sitting on my dash and suddenly started going into a rebooting loop. Regardless of what I did, the unit would just keep rebooting. After a quick call to TomTom’s support number (I got right through to a live support person), they advised me to return the unit to Best Buy for an exchange since I was well within the 30-day exchange window. I’m pretty sure it must have been some sort of software/operating system error, since a few minutes before I had entered a new favorite location. The replacement unit is working great. The TomTom rep gave me a reference number to call back with when I had the replacement unit so they could make the necessary changes to associate it with my existing account in their system, which I did. There are much more expensive GPS units on the market (sold at truck stops) aimed specifically at truck drivers which look enticing, some of them priced up to 200% more than the units sold at a place like Best Buy or other big-box retailer. I talked to a driver that bought one of these very expensive trucker-specific GPS units. He said it was nice, but he didn’t feel the extra trucker-specific features were worth the substantially higher price he had to pay for the specialized unit. It turns out feature I like the most so far is the ability to do Google searches in order to input destinations rather than go through the standard process. Other features I like are that that unit has enough room on its bright, high-resolution 5” widescreen to display my current speed, the current time with the time zone automatically updated, and speed limits with audible alerts if I’m going over the speed limit. It also has a lane assist feature which primarily warns if an upcoming exit is on the left or the right. Another useful, though not always consistent feature is that it can be set to announce upcoming points of interest such as rest areas and truck stops, along with virtually any other type of other business one can think of, including user-defined points of interest. I am enjoying the TomTom GO 2535M Live. 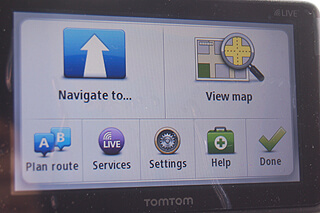 It’s not yet perfect, but with continued updates from the folks at TomTom I’m certain it can continue to improve. One of the biggest problems today is the use of cellphones by people driving. Todd Cochrane spoke to Chuck Cox CEO of Cellcontrol about their solution to this problem at CES 2011. It is a three part solution. The first part of the solution is to integrate the program directly into the vehicle. When the vehicle moves the program is activated. It then sends a message through bluetooth to the cellphones in the car. The program is supported by a most major cellphones and other devices. The program and policies are easy to setup and manage. The policies are also very customizable depending on what is the safety policy of the company or individual is. Cellcontrol is targeting companies with large fleets first, before moving into the direct consumer market. Businesses not only have to worry about accidents causing higher insurance and law suits, but also about the company reputation. According to Mr. Cox twenty eight percent of all accidents involve someone using a cellphone, Driving and texting is 4x more likely to cause a accident then driving while drunk. People are going to use cellphones in their car, the question is how do we make it safer. What Makes A Tech Success? It seems in the world of computers and the Internet there is always a steady stream of new things on the horizon, as well as a steady stream of new products and services. It’s been this way for many years at this point. There are always winners and losers. Winners can win big, and losers at worst fail to make any marketplace splash or even a ripple and end up in the tech dustbin of obscurity with few people ever knowing that the product or service ever existed. What is it that makes for a successful product? Why is it that some products and services that seem very similar to other products and services end up becoming household names, while others end up being cancelled domain name landing pages? It’s obvious there are a variety of factors that come into play. If it were easy to predict these things, we would have a lot fewer losers. Why did Twitter become a household name, whereas similar services such as Plurk and Jaiku languish in the shadows? What enabled Facebook to steal most of the MySpace thunder? New products and services that end up being successful frequently incorporate elements and principles of previously-existing successes, but package them in more compact and useful forms. Initially when Twitter came along a couple of years ago, I heard people talking about it, but I was a bit resistant to sign up. I felt like I had plenty of ways to communicate with people, so why did I need to add yet another account to a service that would steal away time I already had filled, only to ultimately let yet another account go dormant? I finally signed up for Twitter, and after I began using it I began to understand the value of it. With a service like Twitter, the more people that are using it, the more valuable it becomes. About the same time I signed up for a Twitter account, I also signed up for a Plurk account. After a few visits to the Plurk website over a period of a month or two, I haven’t been back to the site since. I believe what is valuable about Twitter is that 140 character limit per Tweet, forcing people to be succinct with their wording. Twitter and Tweet are cute names. The site design is simple, the blue bird logo pleasing to the eye, and the developers kept the API and name open to other developers, allowing an entire ecosystem of ancillary products and services to develop around it at the same time it was rapidly increasing in popularity. Twitter is very much like chat, which was already well established, but it had the added value that it either could be in real time, or not, able to be accessed from a vast array of devices beyond the Twitter website. Twitter also allows you to subscribe to just the people you want, and ignore or even completely block the rest. Twitter also allows you to reach out and touch people, and it allows you to monitor what others are up to whose lives are at once very similar to your own, yet often radically different. You can spend as much or as little time as you wish interacting with the service. Another thing that turned out to be incredibly useful with twitter is the vast 24/7 real-time data stream that it generates. Real-time Twitter data mining has proved to be quite valuable to many people. To be honest I have always thought that many MySpace pages were often monstrous, unbelievably cluttered messes that often took a long time to load. Nonetheless, MySpace became popular because it obviously served a need with a younger demographic. I’ve always thought Facebook’s interface is somewhat confusing, though allowing for far less cluttered and confusing-looking profile pages. I still don’t quite understand what got Facebook to the level of critical popularity – perhaps the less-cluttered, faster-loading profile pages gave it the critical edge over MySpace. It should also be noted that Facebook allowed for an open API, allowing a myriad of interesting and often useful applications to be plugged in to its interface. However it did it, Facebook managed to get to a critical mass of users where it became THE thing to sign up for and THE place to be to stay connected with family, friends and business associates. Something interesting has happened with Facebook that has never happened before – everyday, non-geek people who had never built website profiles in all the years they had been doing email and web browsing were suddenly signing up for Facebook in unbelievable numbers. Mothers, dads, aunts, uncles, grandmothers, etc. were suddenly showing up on the same service with their kids, nieces, nephews and grandkids. Once the ball rolled, Facebook became an incredible success. I started noticing a while back that many people were starting to use Twitter and Facebook to communicate with each other in lieu of email. At this point I find myself getting pulled into that trend myself. These services don’t offer the relative privacy of direct email, but they allow for easy, frequent public conversations and easy sharing of personal media such as photos between friends and family on a global scale. What I take away from the success stories versus the less-successful competitors is that oftentimes the differences in design and implementation can be slight, but those slight differences can offer real, tangible advantages to the end user. If those often-slight advantages can somehow help get the product or service to a critical mass threshold, they can find themselves catapulted to the point of planetary awareness. CFI Group has released its most recent figures for smart-phone providers. The list includes AT&T, Sprint/Nextel, and Verizon, among others. According to the survey, Verizon smart-phone users ranked the carrier positively 79% of the time; Sprint/Nextel smart-phone users liked their service 74% of the time. ATT iPhone users, on the other hand, scored only 69%. The biggest complaints are dropped calls, slow 3G service, and other network problems. This is the first time AT&T has been at the bottom of the list. But I have to wonder, are these figures misleading? After all, AT&T has the lion’s share of the market with the millions of iPhone users out there, while Verizon and Sprint/Nextel have a much smaller customer base. One of the reasons Verizon and Sprint/Nextel’s network has such good uptime for smart phones could very well be that the load on their network is much reduced from the monster load that is trying to make its way through the AT&T network. It is likely, and probably inevitable, that should the same high traffic hit the Verizon and Sprint/Nextel networks, there would be as many, if not more, complaints. The fact is, none of the wireless networks are truly able to handle the load that iPhone users require. Is it possible the world wasn’t ready for the iPhone? Or at least, the providers’ networks weren’t ready for the iPhone? Even with massive, billion-dollar spending to upgrade existing networks, it may be some time before wireless networks are truly ready for smart phones in everyone’s hands. I don’t suppose that’s much of a consolation for those with iPhones in their hands but no decent network to run them on. With the release of the Kindle 2 from Amazon this week, we techies are faced with another financial pitfall. Do we buy or do we not? How many of our gadgets end up being pricey, not just for the initial purchase, but for the continued upkeep or subscriptions for the device in the long run? What is the TCO (Total Cost of Ownership) on the product? One of the biggest complaints about the Kindle is the cost, around $360. And while you are presumably getting unlimited wireless download service for years to come, the books themselves aren’t free. Okay, some books are free, but those are public domain. Books range in price from $4.36 (Feng Shui A to Z) to $6,431.20 (Selected Nuclear Engineering Systems, Part 4). The Kindle holds 1500 books, so even if you look at the low end of about $5 per book, your Kindle could cost you $7860.00. Or more, if you are into Nuclear Engineering Systems. So total TCO for device could really get up there at some point. The iPhone presents the same sort of issues, in a different way, than the Kindle. The higher-end iPhone will cost you about $400 plus an ATT wireless contract locking you in to two years of service with a base price of $70 per month. Then there are the applications you are expected to buy to make your iPhone be all that and the kitchen sink, and you’re talking a pretty good chunk of change in the TCO department. And I’m not going to let the iPod slide either…Mine was $350 for a 60 gb video model, plus another chunk for the extended warranty, and I purchase all of the music I am storing on my iPod, whether electronically (eMusic, iTunes, Rhapsody), or by CD. I’ve had my iPod for 3 years and have about 6000 songs on it; I estimate I’ve spent another $400 buying music that I didn’t already own. That’s a chunk of change too, although it’s a bit more spread out and may not be so obvious. There are times when I want a device to do just one thing and do it well (like the iPod). But then there are times when devices that serve multiple purposes can have lower TCO. For example, if I want to read eText, my laptop can already do that, and I can even have it read it to me with text-to-speech. My laptop is reasonably portable, as well, and would hold a lot of eBooks, too. And it holds my entire iTunes/iPod library as well. It’s just a little hard to carry around in my pocket, and it isn’t very good at making phone calls on the run. But when it comes to TCO, it is something we have to consider, especially in these scary economic times. It’s not just the initial cost of the gadget. It is the long-term costs of service and support for that gadget as well. How many of us have made this decision when it came to home printers, and went from ink jet to laser jet, because of the TCO when it came to ink and toner? For me, the Kindle and the iPhone have not hit my “must have” list because of TCO. How about your must-haves? Is TCO not a consideration, or are they a good return on your investment? Over the past two months we have had a Indian development firm under contract to develop for us a shopping cart that we were going to roll out over a month ago. The experience with this firm has been less than positive. We charted out how long the job would take and expected it to be a 2 to 3 week job tops and what we have after two months is a shopping cart that needs a lot of clean up work. Issues we faced with this Indian firm included promising we would have senior developer from the start but our guess is that the developer they assigned to us had a year of experience if we were lucky. At week 4 I put the hammer on them and they assigned some more knowledgeable but he spent the next 2 weeks cleaning up the code the first developer had mangled. It was a truly terrible experience and while we got the product we largely wanted it was not at the speed we would have expected. We probably saved a couple of thousand dollars at the expense of the shopping cart taking 2 months when it should have taken 3 weeks. My recommendation to anyone looking to hire Hidden Brains is to have very low expectations. They talk a big talk but fail to be able to operate at a competency level that I would expect. While the company may be able to do basic web designs they in my opinion can not be relied up to work with companies that are looking to integrate features into existing code design.